Recently, Emily Wessel of Tin Can Knits came out with a new pattern book: Handmade in the UK, which contains many cute lace items knitted in artisan local yarns. Emily, who was born in Canada but lives in Edinburgh, was inspired in her work by the landscape and nature surrounding her new home. Being myself a lover of local produce, ordering the book was an opportunity to support one of the skilled designers working in the UK and thus I ordered both the ebook and the print version. 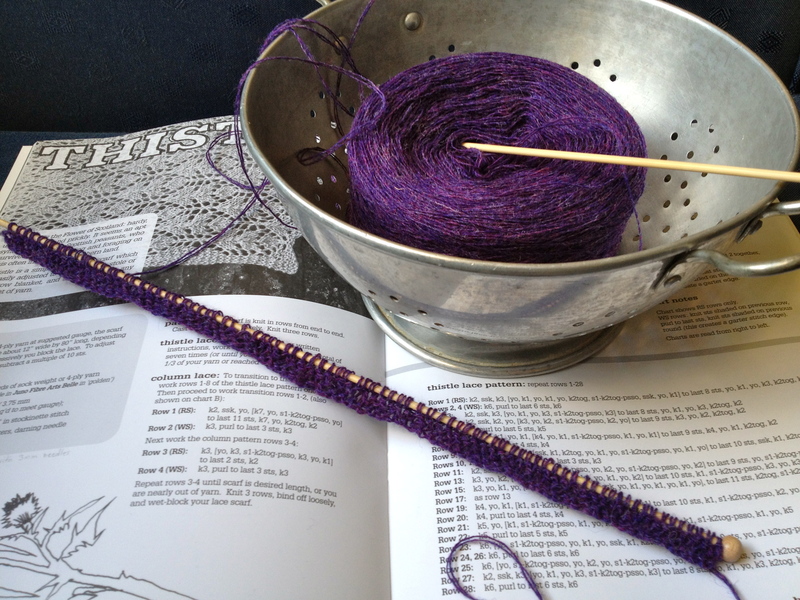 After long pondering, I am going to attempt a lace scarf (if it comes nicely, I’d also like to try in the larger version as a stole): Thistle, which is the flower of Scotland and one of my favourite. Because I have a huge stash, I prefer to use one of the yarns I already have rather than the one suggested in the pattern. Thus I’m knitting with a pure Shetland 2-ply in double strand on needles size 3mm. I also changed to a shade that I prefer – a fairly vibrant purple, which you may remember from my previous post on Shetland yarns. Changing the weight of the yarn and the size of the needles, I slightly modified the pattern by adding a few more repeats for each row. So far, I only started the border and am now about to begin with the lace pattern. I’m curios to see how it will come out in the yarn of choice. In any case, it will probably take me ages (if) before it’s completed!